The Club's constitution is a slightly modified version of the Act's "model rules" and was last updated on the 17th May 2016, which coincided with the change of the Club name. 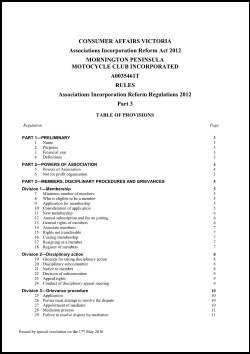 To operate safe and legal facilities for motorcycle riding, rider training and education for use by Mornington Peninsula residents or ratepayers. To promote motorcycle riding for local youth and families. To encourage and enhance positive interaction between Police, motorcycle users and other members of the public. The Hastings motorcycle track is maintained and operated by the Association under a lease with BlueScope and a Planning Permit from the Mornington Peninsula Shire. Click on the thumbnail to download a copy of the current Rules of Association.